The Metropolitan Opera's 2006-2007 Season is Here! Our broadcast season continues Saturday, January 27, 2007 at 10:30 a.m. Pacific Time with Puccini's Madama Butterfly. For details, click here. 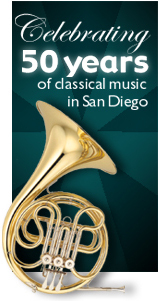 For over 50 years, KFSD has been bringing great classical music to San Diego. Other formats come and go; but KFSD continues to feature the best music the world has to offer, every day. AM 1450 KFSD is proud to present classical music by the top symphonies and chamber music ensembles, as well as the Toll Brothers—Metropolitan Opera live from New York City. Request your favorite classical pieces, and hear them on KFSD Listener Request Friday ! And now, with our live Internet audio stream, you can hear the great classical music of KFSD anywhere in the world! Enjoy Classical AM 1450 KFSD while you work, play, or just relax.